As I hope most of you will have already seen elsewhere, February Nerd Night has changed locations. We are now meeting at Geeks Cafe on Babcock Rd. Same time, still Friday night, February 12, at 7pm. Just a shiny new location. 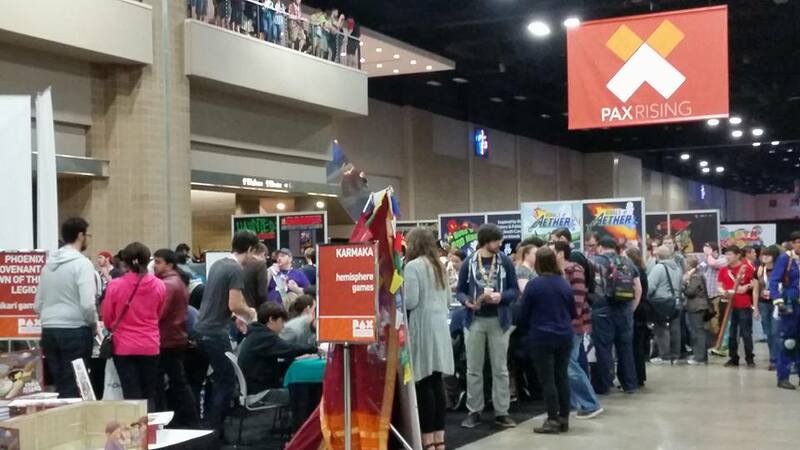 While that last-minute news did nothing good for my level of stress on Friday afternoon, I did manage to get my stuff together and get postcards/business cards handed out at PAX South. The Enforcers (PAX volunteers) couldn’t have been nicer or more supportive, pointing me to a table near the games checkout where I could leave my materials, and I’d estimate a good 60-80 were picked up during the con! So maybe we’ll see some new faces. Also, the Enforcer I spoke to during my 5-midnight shift (at the Iello Games tables in the Foam Brain Games booth) took my card and said he would look us up when they started planning next year’s tabletop area. Looks like we might have the opportunity to come in to the con next year, teach games, and meet fascinating folks! I met a lot of game designers, talked to game publishers who will perhaps start sending us swag for raffles and a game library, and shook hands with enough people to pick up quite the nasty, voice-stealing cold. The ultimate PAX souvenir, I guess. All in all, it was a great experience. Thanks to Iello and Foam Brain for making our area so much fun. I learned how to play a few Iello games really well. I played my first military tactical game in a long time, and while I won’t say I learned it really well, I can play the heck out of Shadows Over Normandie‘s first campaign scenario. We also played Welcome to the Dungeon, Steam Park, Medieval Academy, Dungeon Fighter (which has some ludicrously funny “dexterity” requirements), King of New York, and Fun Farm. At some point I’ll get the opportunity to choose some games from Iello, and I’m looking at a few goodies that I wished had been available for demos – The Big Book of Madness and World of Yo-Ho stick out in my mind at the moment. We’ll see what my choices are when I get that magical email. World of Yo-Ho uses your smartphone or tablet to make a custom pirate ship that sails on a map. It’s so cool. Check out the link above for a video (the bottom video). Anyway! I also visited the Indie Games area and play-tested as many as I could. I only had 3 hours or so in the Main Expo hall — since I worked on Friday and half of Saturday morning was spent dealing with the venue change for Nerd Night — but I put them to good use. I met one of the designers of Karmaka, Dave Burke, and that is possibly the most gorgeous game I’ve ever seen. Backed it on Kickstarter, so we’ll get a copy of that one when they ship. 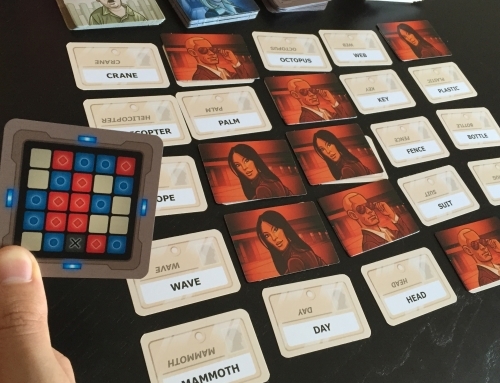 There is a print-and-play available here, and I will try to have a copy of it at Nerd Night. You start life as a dung beetle, and try to live your lives well enough that you eventually reach enlightenment. I played a lot more games, but a lot of my pictures were crappy. Bad light, Steph in a hurry.. but here are a few. So. I’m going to stop here, and fill you all in on the latest developments for Nerd Night in my next post, either tonight or tomorrow. I’ll tease you by saying big changes, all for the good, are coming down the pike! I’m excited to see what 2016 brings for us!